Achara of Thailand presents this elegant wrap ring with a design resembling the morning sunrise. 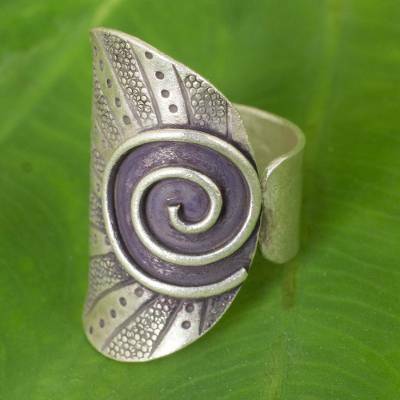 It is hand stamped by the artisans of the Karen Hill Tribe with a bold spiral center and patterned sun rays which are accented by an oxidized finish. You can find silver wrap ring 'Karen Rising' by Achara in jewelry categories such as Hill Tribe Rings, No Stone Rings, Silver Rings, Fine Silver Rings, Wrap Rings and Cocktail Rings. Enjoy exploring these sections for other Novica treasures. Such a cool silver ring, with the sun circle and spokes extending out off center it goes great with easy going clothes. Fits great. I love this wrap around ring, it's very comfortable and unique! love to get compliments on it. I bought this ring for myself as a birthday present. I love big chunky rings! I was a little worried it might not fit. There were only 3 sizes available! I was pleased to find that it was adjustable, something I didn't notice it the photograph. This is a substantial piece. Not for feeling dainty. "Love this ring so will you if you love unique ring"
I love everything about this ring. It opens so you can change the size and use on different fingers, yet, it never falls off. The color in the photo does not do it justice. It's just beautiful. It can be worn anytime with jeans of when you are dressed up. I usually wear it on my middle or ring finger. Beautiful and unique! Thank You!